In 51% of cases, physicians fail to obtain the indicated follow-up exams. If suspicious morphology or upper lobe location, consider 12-month follow-up. Multiple CT in 3 to 6 months. If unchanged, consider CT at 2 and 4 years. If suspicious, consider follow-up at 2 and 4 years. If grows or increasingly solid, consider resection. Multiple CT in 3 to 6 months. If unchanged, consider CT in 2 and 4 years. (100-250mm3) Solid Solitary CT in 6 to 12 months, then consider CT in 18 to 24 months. 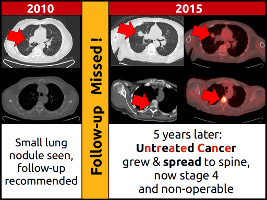 CT in 6 to 12 months, then obtain CT in 18 to 24 months. Solitary CT in 3 to 6 months to confirm persistance. If unchanged and solid component below 6mm, CT annualy for 5 years. Persistent part-solid nodules containing a solid componment > 6mm are highly suspicious. Multiple CT in 3 to 6 months. Then management based on most suspicious nodule(s). 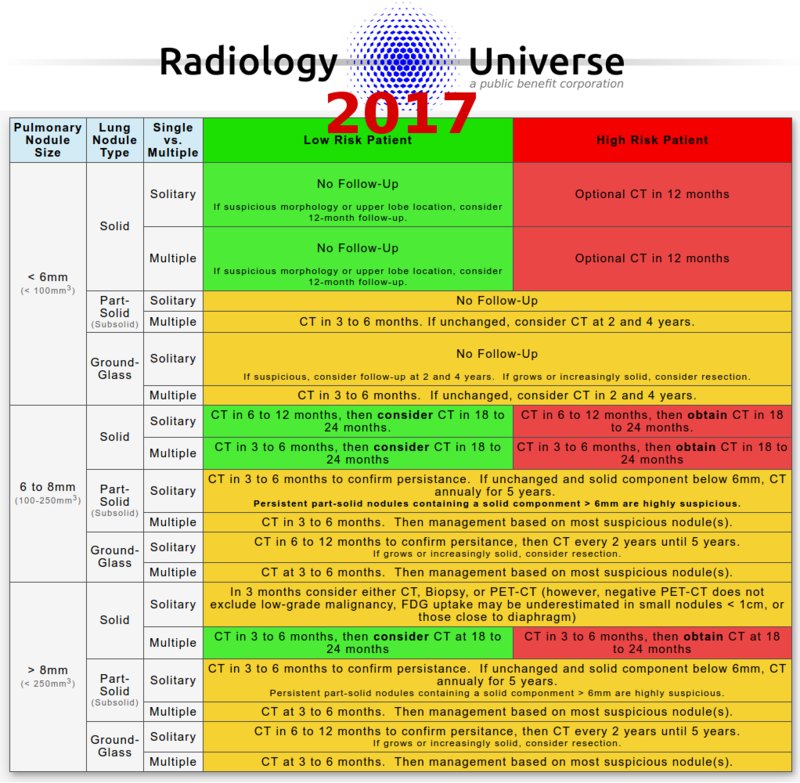 Ground-Glass Solitary CT in 6 to 12 months to confirm persitance, then CT every 2 years until 5 years. If grows or increasingly solid, consider resection. Multiple CT at 3 to 6 months. Then management based on most suspicious nodule(s). Patients who have a known cancer. Lung cancer screening, which has separate criteria. Intra-fissural, perifissural, and subpleural pulmonary nodules. Perifissural lung nodules are usually benign, unless suspicious nodule morphology is present (reference). Displacement of the pulmonary fissure. In these cases, follow-up should be considered. Diameter of lung nodule is the average of the short and long axes, rounded to the whole millimeter. Family history of lung cancer. Upper pulmonary lobe location of nodule.